It's not often that a woman my age finds herself surrounded by an entourage of handsome males -- but last night I had the privilege of taking my two sons and their friend (let's call him Stormtrooper) for a night at the circus. 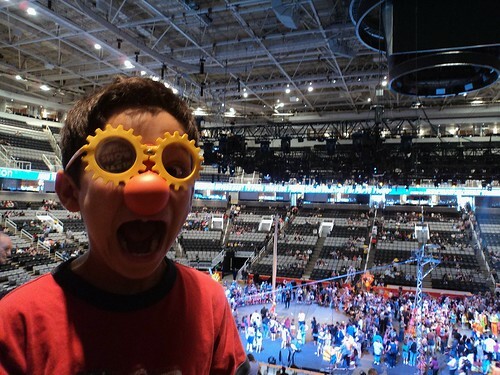 We watched Ringling Bros. and Barnum & Bailey's production of Fully Charged at San Jose's HP Pavilion, and boy were those boys fully charged from the excitement of the show! Ringling Bros.® powers up audiences with acts from all over the globe featuring breathtaking dare-devilry, superhuman stunts and never-seen-before performances that spark the imaginations of Children of All Ages! Clowns from the world-famous clown alley charge the audiences¿ funny bones, while megawatts of thrills explode out of the ring including The Human Fuse who rockets across the circus skies igniting the power of the people. And of course, amazing animals that spark the audience¿s awe and wonder. Experience the current of excitement at Ringling Bros. FULLY CHARGED! Gasping as the Fernandez Brothers ran and jumped and spun on giant hamster wheels (okay, they're called "Twin Turbines of Steel", but they look like giant hamster wheels to me!) that rotated through space. 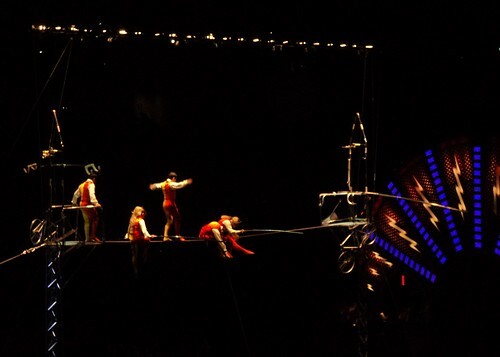 Marveling at how the Danguir Troupe was able to walk, run and bike across the high wire! 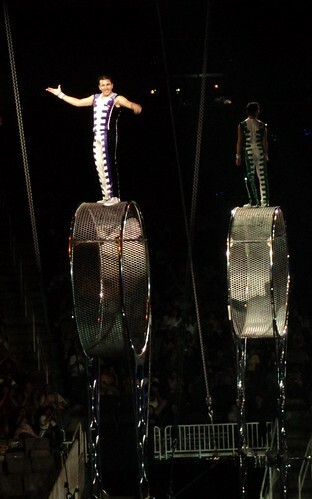 They even lay down and jumped rope as though they were just inches from the ground, not high up in the air. If you're watching Fully Charged in Fresno, San Diego, Sacramento, Denver or Salt Lake City, there's even more fun awaiting your family. Arrive 90 minutes before show time for the Ringling Bros. Animal Open House, where families can see the circus elephants up close, speak to animal care team members and learn about Ringling Bros. commitment to animal conservation. 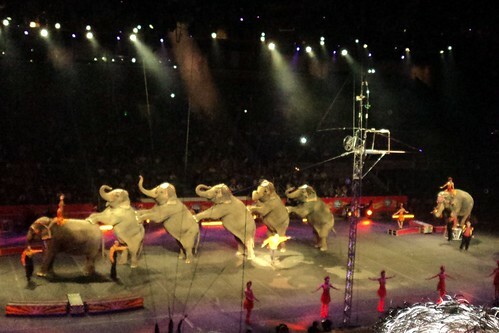 I'm not too enthusiastic about the animal acts myself, but I have to say I enjoyed the animal acts on Fully Charged more than I have in other Ringling Bros and Barnum & Bailey circuses I've watched, mainly due to the animal tranier, Tabayara. He's a true entertainer who performs with style and flair, and keeps a running commentary of what he's doing -- he's miked up, so the whole audience can hear him making jokes and talking to the animals. Probably the only thing I'd really change about this production is the start time -- at 7:30, it's a bit late for the little ones, especially on weekdays. It was almost 10:00PM by the time we were all settled in the van for the drive home! If bedtime isn't an issue for you, then by all means treat your family to a night at the circus, and get ready to have some fully charged fun! The San Jose performances of Fully Charged are over, but Fully Charged is playing in the San Francisco Bay Area in San Francisco's Cow Palace and Oakland's Oracle Arena on the dates below. If you don't leave in the Bay Area, you can view the full performance schedule on the RIngling Bros. and Barnum & Bailey website to see if there's a show near you. In celebration of Labor Day, Feld Entertainment is offering a $10 discount on all seats, on both regular $25 seats and $40 VIP seats! Hurry and buy your tickets online at ticketmaster.com and by phone at 800-745-3000, because this offer ends on September 6. To redeem this offer, use customer code LABOR. *SPECIAL NOTES: SAVE $10 Labor Day Offer is only valid on regularly priced $40 VIP and $25 seats. Seats are sold on a first-come, first-served basis. Popular performances sell out quickly, so act now! This special eBuzz ticket offer is available by phone and online only. This offer is not valid at ticket outlets. This offer may not be combined with any other offer and does not apply to group sales orders. This offer valid only for show dates and times listed above. Use your American Express, Discover, Mastercard, or Visa(service charges and handling fees may apply). Get $15 tickets for opening night at San Francisco (Thursday September 1, 7:30PM performance) and Oakland (Thursday September 8 at the 7:30PM performance). Disclosure: I received 4 tickets to the show, courtesy of Feld Entertainment. Product information is provided by the featured company/product and is indicated in italics. The views and opinions expressed here are my own. Take Gatorade's BECOME Pledge, support young athletes -- and win a soccer ball autographed by Brandi Chastain! 3Po and Jammy's first soccer practice is this Wednesday, and I think I'm looking forward to it as much as they are. Call me weird, call me a helicopter parent or call me a soccer fan, but I actually enjoyed being a soccer mom last year and I'm pretty sure I'm going to enjoy it again. I don't care whether they end up playing in the English Premier League (Alfie's ultimate dream) or playing weekend pickup games --my sons really do play their little hearts out, so they deserve no less than a parent who is as fully committed as they are. At BlogHer this year, I had the pleasure of attending the Gatorade Sports Moms session, with special guests Brandi Chastain (former US Women's Soccer Team Member and Women's World Cup Winner) and Loreane Tomlinson (mother of San Diego Chargers running back and NFL MVP LaDainian "LT" Tomlinson). Brandi and Loreane had some practical tips (i.e. proper nutrition, hydration, staying healthy, avoiding injury, etc..), useful advice (i.e. the fine line between advocating for your child and being a pushy parent) and words of inspiration for parents of young athletes. They encouraged everyone to take the Gatorade BECOME pledge so that not just our kids, but all kids have the opportunity to fulfill their potential as athletes. It was great to see so many sports moms in one place, all committed to supporting our kids to be the best athletes they can be! Gatorade is calling upon people to pledge their support to young athletes in their quest to BECOME. Gatorade will donate one dollar up to $10,000 to the Women’s Sports Foundation for every pledge received at www.Gatorade.com/moms (just click “take the pledge now” on the main Gatorade Moms page). Simply read the pledge, click to commit and Gatorade will donate a dollar in support of girls’ and women’s sports. The donation will help ensure there are opportunities for all children who want to get physically active, get involved in competitive athletics and get in the game. I had the pleasure of meeting Brandi Chastain at the Gatorade Sports Moms session at BlogHer 2011. Unfortunately I can't arrange a meeting for you, but I can do the next best thing! Gatorade will be giving one lucky Bonggamom Finds reader a soccer ball autographed by women's soccer star Brandi Chastain. 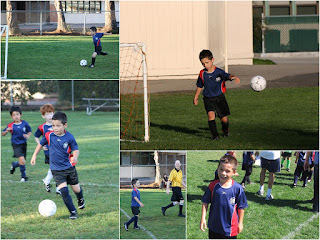 What a great way to inspire your own budding soccer star! Leave a comment on this post with a tip for keeping your young athletes safe, healthy and happy this soccer or football season! This entry must be completed before any extra entries will count. 2) Leave a comment on my soccer mom post and share your views on being a soccer mom or sports mom. Do you love being one or are you already looking forward to the final game? How do you think a sports mom should support her child? (1 entry). 4) Follow Bonggamom Finds via GFC (1 entry). 5) Blog about this giveaway, making sure you include a link to the giveaway in your blog post (1 entry). This giveaway ends at 11:59PM PST on September 16, 2011; I will draw a winner on September 17 and post the winner's name after he/she confirms acceptance. Continental US residents only. For additional giveaway rules, click here. Good luck! Disclosure: I will be receiving my own Brandi Chastain-autographed soccer ball, courtesy of Gatorade, as a thank-you for posting this information. The views and opinions expressed here are my own. Let’s be honest, moms work hard and they definitely deserve time to unwind with a good book! More and more, tech-savvy moms are reading with the latest gadgets: e-readers. What better way to protect your device from the hazards of being a mom than with a protective cover? Whether you’re the stylish mom, the adventurous mom, the working mom, or perhaps all three - there is a jacket for you! M-Edge sent me the Executive Jacket in Mocha brown to try out, and I couldn't be happier. The cover is made of beautiful, buttery leather in a warm brown shade. I love the clean, classic look! Both my husband and I can carry this around and protect our iPad in style. The iPad 2 slides into the case, via a couple of elastic straps at the top. I haven't owned this case long enough to know whether they'll stretch too much over time to hold the iPad safely, but for now everything is nice and snug. Ditto on the strap that secures the case closed -- it also secures the case when you flip it as a book stand. Right now the flap fit nicely into its little slot, but I'm wondering if it might become a bit thinner and slipperier over time. Oh well, I'll cross that bridge when we get to it... if we ever do. I love that the inside back cover has pockets to hold a few cards and slips of paper. And I love the plush grey suede-like lining, which protects the iPad even more. The center spine also has elastic tabs to hold earphones or a stylus. It's the perfect cover for keeping things neat and organized! The only shortcoming of the Executive Jacket is the lack of camera hole on the back so you can take a photo or video with your iPad, or use it to videoconference, without having to take the iPad out of its case. But I'm really conflicted -- I love the smooth, unmarred look, and I'm not sure I'd like have a hole in the leather. If the executive look isn't your thing, fear not: M-Edge makes a whole array of covers for the iPad. Check out their faux book covers, where you can channel your inner literati with covers that resemble vintage editions of The Great Gatsby, To Kill a Mockingbird, or the New Yorker Magazine. They also make cute covers for the Kindle, Nook, and Sony Reader, as well as the Samsung Galaxy tablet. You can even design your own cover! Whatever your style and however you use your iPad, M-Edge has got you covered. Disclosure: I received a product sample to facilitate my review, but have not been paid to review the product or give my opinions. Product information is provided by M-Edge and is indicated in italics. The views and opinions expressed here are my own. · Comfort, convenience, and safety are important in a backpack. Find one with wide, padded shoulder straps to distribute the weight over a large area of your child’s shoulder; an abdominal strap to distribute the pack's weight evenly on his/her back, waist, and hips; and reflectors or reflective fabrics to add visibility at dusk or dawn. · Students spend so much time staring at paper, it may surprise you to know that the higher the contrast, the more strain on your son or daughter’s eyes. If the school allows it, give your child yellow or green paper. These colors actually offer reduced contrast and brightness, easing the strain on their eyes. · The sun’s rays are the strongest between 10a.m. and 4p.m. and although summer is waning, the sun remains strong in fall. It’s still very important to make sure your child is properly protected during recess. Try a wide brimmed hat, and Coppertone Kids Pure and Simple, which is gentle and tear-free or Coppertone Kids Stick, which is quick and easy to apply. I posted a similar plea to parents to keep their kids sun-safe in the fall, and I'm doing it again. I think it's even more important to be vigilant about kids' skin during the fall/ Indian Summer days, because we no longer have the awareness of sun, sand, surf -- and skin cancer. The kids are sill wearing exactly the same clothes they did during the summer, and they still play out in the sun during recess, lunch and P.E. So we still ask the kids to put sunscreen on their exposed areas (face, neck, ears, arms and legs) before we walk to school in the morning. 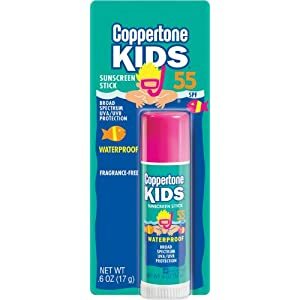 And each of them has a stick of Coppertone Kids Sunscreen Stick so they can reapply during lunchtime. We all love the stick because it's not messy. If it's not a hassle to put on, kids are more likely to reapply sunscreen on their own! It make me feel a lot better knowing that my kids' skin is protected from the sun, even when I'm not there to help them. Disclosure: I received some Coppertone Kids samples as a thank-you for posting this information. Back-to-School safety tips were provided by Coppertone Kids and are indicated in italics. The views and opinions expressed here are my own. You don't usually associate Hi-Tech with girly toys and doll playsets, but at this year's Big Toy Book Sweet Suite I discovered a really cool toy that girls are going to love: Lite Sprites. They are tiny fairies that girls can transform to change to any color they want. The magic happens with the Light Wand, a device that captures color from any flat surface and transfers it to the Lite Sprite dolls. There are five Lite Sprite dolls, a host of Lite Sprite pets, and playsets ranging from little slides to swings to a whole tree house! WowWee, an award-winning manufacturer of toys, is set to release Lite Sprites™, a new toy brand for girls that is equal parts magical, interactive, and empowering. For the first time ever, girls have the power and ability to magically collect and share color and light in the unique play world of Lite-Topia. The Lite Sprites™ live in Lite-Topia, an enchanted land that sparkles with color and light. The Sprites collect, share and use color and light to express their emotions. The Sprite Sisterhood includes five Sprites, each with a special power: Prisma, the leader; Astra, the keeper of the skies; Brooke, who takes care of the water; Meadow, who is responsible for the plants, flowers and trees; and Bleak, the rebel Sprite who uses her powers to disrupt color in Lite-Topia. Catch the Lite Sprites™ animated web series at YouTube.com/LiteSprites to follow along each week as lead Sprite Prisma and her friends discover their Lite Wands. For more info about the story behind the Sprites, check out LiteSprites.com. The magic begins in early August when Lite Sprites™ will be available at retail. The brand is launching with one Lite Wand, five Lite Sprites™ (each with her own Forest Pod), four deluxe playsets (Waterfall, Windmill, Flower and Swing), the Tree of Lite Playset, and 21 collectible Lite Pets. Using the Lite Wand, girls ages 4+ can collect almost any color from nearly any flat surface in their real world environment and magically share it with the Lite Sprites™ and their world. The Lite Sprites™ can catch color from the Wand, can share and catch color from each other, and also with the playsets. Each playset includes a path so you can collect and connect playsets to create an ever-changing world of color and light. We received the Prisma and Lite Wand set to review, and my kids are fascinated with how they can capture any color in the real world and make Prisma change to the same color! Just set the bottom of the Lite Wand on any flat surface; the bottom has a scanner that lets it pick up the surface's color. The crystal ball at the top of the wand will change to the new color. The set comes with a paper color wheel, so you can set the Lite Wand down on each petal to get some of the most popular girly colors (teal, pastel pink, pastel blue, etc..), but you can use any flat surface. My daughter had great success picking colors from books, magazines, her bedspread, even her drawings and paintings! My boys also loved picking up colors, and have done many experiments on more unusual surfaces like brown paper bags or patterns. They also learned that the Lite Wand will not pick up black or colors that are too dark. Now, turn Prisma on -- she will flash a range of colors before settling on one. Point the Lite Wand at Prisma, then press and hold the diamon button on the Lite Wand. Prisma will change color to be the same color as the crystal ball on the Lite Wand! The Lite Wand can hold up to ten colors, and you can toggle through the colors by giving the Lite Wand a quick press. They are so cute! If you haven't played with the Lite Wand or your Lite Sprite for a long time, it will turn itself off, which is a really nice feature since kids leave their toys turned on all the time and waste a lot of battery life. * Prisma and the Lite Wand is your starter set; none of the other Lite Sprites come with the Lite wand. So make sure you buy this set before you buy any of the others! * The Lite Wand emits a sparkly, magical sound whenever you turn it on or press a button. It gets old pretty quickly. It does have 2 volume levels, high and low, but you can't turn the sound off completely. * I'm a bit surprised at the relatively high prices of these toys! The Prisma and Lite Wand is priced at $29.99 at Target.com, and the other Lite Sprites (without the Lite Wand) cost $14.99 at Target.com. The playsets start at $19.99 on Target.com. It's even more expensive on Amazon.com ($49.99 for the Prisma and Light Wand, $34.99 for each of the other Lite Sprites, playsets starting at $34.99). It will be difficult to stay competitive with the other girls' toys and playsets -- but when it comes to the latest hot toy, parents might not care about the price! These cool toys are next in line to be the holiday season's hot toy -- start saving up for them now! 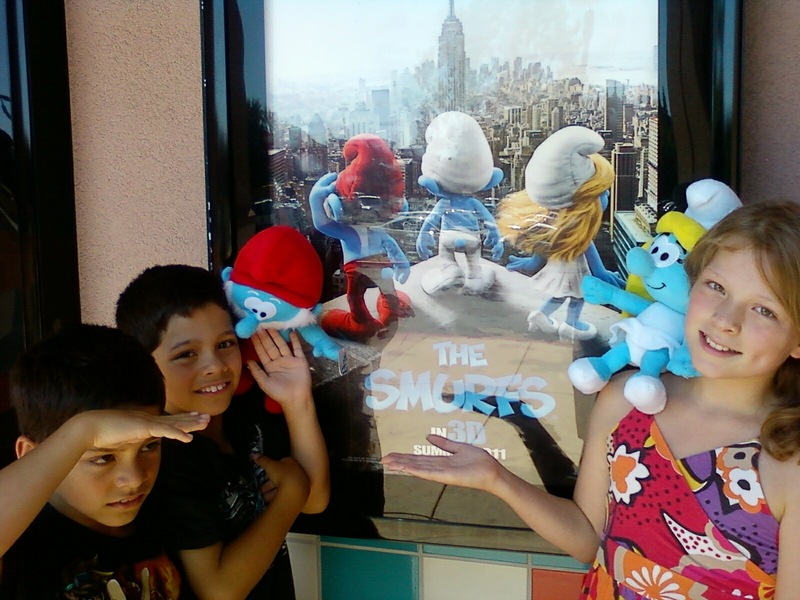 Have you seen the new Smurfs movie yet? If you grew up watching the Smurfs like I did, you'll probably come out of it feeling a wave of nostalgia -- or nausea, depending on how much you hated the Smurfs La-la-lala-la-la song -- and a twinge of admiration for how well they integrated the computer-animated Smurfs into real life scenes. Kids, on the other hand, won't have mixed feelings at all. 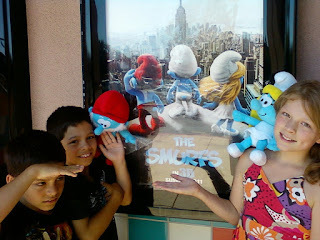 The Smurfs was my kids' favorite summer movie! It was a fun, nonthreatening movie that's completely appropriate for little kids. Now, of course, they're on a mad rush to collect all things Smurfy -- books, notebooks, stickers, dolls, figurines, anything cute and blue! They were thrilled to see Smurf figurines in McDonald's Happy Meals, and so we've had a resurgence of interest in eating at McDonald's. After active days at summer camp, I was happy to let them unwind over a Happy Meal of chicken nuggets, low-fat milk and apples. Next month, when the new Happy Meal debuts, they'll even be able to have a few fries without having to give up their apples. One of our favorite things about the Smurfs promo was being able to help save the earth -- or rather, Smurf the Earth -- by entering the codes on their Apple Dipper packages at HappyMeal.com. For every code entered, Keep America Beautiful will plant one tree, up to 100,000 -- over 250,000 codes were entered, so they've met their goal with time to spare! I'm kind of sad to see the Smurf Happy Meal promo end tomorrow, since we didn't manage to collect the entire set. We did get a little help from the folks at McDonald's -- I came home from BlogHer with a few extra Smurf figurines that were being given away at the McDonald's booth (I know a lot of the McDonald's folks who were at BlogHer from last year's Family Time Getaway, so they generously looked the other way when I nabbed a couple -- okay, more than a couple -- coupons to feed my McDonald's Fruit & Maple oatmeal addiction!). Oh well, there's always eBay -- and for you Bonggamom Finds readers, there's my giveaway below! Four lucky (or should I say Smurfy) Bonggamom Finds readers will win prizes from McDonald's! Leave a comment on this post and share your favorite Happy Meal memory. You can talk about your favorite Happy Meal toy, or your child's standard Happy Meal order, or the first time you had a Happy Meal, or the time you and your college buddies ate ten Happy Meals each, or whatever! This entry must be completed before any extra entries will count. 1) Leave a comment on my latest Happy Meal post and share your views on the changes McDonald's are making to their Happy Meal (1 entry). 2) Leave a comment on my latest Happy Meal post and share your opinion on including free toys with kids' meals -- yay or nay? Do you think San Francisco was right to ban the Happy Meal? (1 entry). 3) Leave a comment on this post and tell me your favorite Smurf! (1 entry). 5) Follow Bonggamom Finds via GFC (1 entry). This giveaway ends at 11:59PM PST on September 14, 2011; I will draw a Grand Prize winner and three First Prize winners at random on September 15 and post their names after they confirm acceptance. Continental US residents only. For additional giveaway rules, click here. Good luck! Disclosure: I picked up Smurf Happy Meal toys and product coupons at the McDonald's booth at BlogHer. McDonald's e is providing the prizes for this giveaway at no cost to me. This promotion is not being administered or sponsored in any way by McDonald's or its affiliates, but solely by Bongga Mom. Any questions or comments regarding this promotion must be sent to me at Bongga Mom and not to McDonald's. The views and opinions expressed here are my own. Just in time for the new schoolyear, Tea Collection's late Fall collection is out in stores and on their website. Their latest collection is inspired by colors and the culture of Mexico, with its bold graphics and warm colors. I have always been a big Tea fan -- I think the day they extended their Children's Clothing line to fit kids up to age 12 should be declared a national holiday! -- and I was thrilled to be invited to preview some items from their Mercado Mexicano line. Here's Jammy, all set for the first day of school in his new Tea outfit. He's wearing the Adios Bicicleta tee and Surplus Playwear pants in British Khaki. When it gets colder, he can wear the Zócalo plaid shirt on top in place of a jacket. I love hooded shirts, and Tea's Happy Hoodie (in Cinnamon) gives a real "cool dude" vibe to 3Po's outfit. The green color of the Surplus Playwear pants goes really well with the spicy orange color of the Happy Hoodie; the size 8 is a tad large for him, but thanks to the adjustable waistband, I can cinch in the waist, roll up the pant cuffs and send him out to play. You don't really think of blue as a fall color, but when it's used in a pattern like in Jammy's Chapultepec polo, it makes a beautiful contrast to the warm orange tones. Even though blue is Jammy's favorite color, he wasn't too sure about this one (Mama, it's too formal!) -- I convinced him that the retro look of the shirt would get him lots of compliments at his friends' birthday parties (if not from the kids, at least from the parents!). The Boy's Clothing line is full of bold graphics that boys love -- skulls, bikes, lucha libre wrestlers -- and their moms will go wild for the beautiful warm fall colors. Those colors stay nice and vibrant, even after multiple washings, and the cotton fabrics just get softer and softer. 3Po and Jammy have always been very sensitive to how their clothes feel on their skin, so I've always loved how soft Tea's clothes are. I like to complain about the state of kids' clothing in the US, and how I have to travel to the UK and Europe to find really unique, stylish children's brands -- but I have to admit that my complaints are completely unjustified when it comes to the Tea Collection. They are as hip and fashion-forward as anyone out there, and I'm thrilled that 3Po and Jammy will be starting the new school year in style! Disclosure: I received a selection of product samples from Tea's 2011 fall collection to facilitate my review, but have not been paid to review the product or give my opinions. Product information is provided by the featured company/product and is indicated in italics. The views and opinions expressed here are my own. These tiny cars have made a big impact on my kids! They love the small size -- it's small enough to slip into a pocket or a purse so they can take it on playdates or to the park -- and the lightning speed. They're great for launching off low platforms, zipping through their Hot Wheels 360-degree loop tracks, and racing down the driveway. The cars charge very quickly and easily -- you just plug it into the remote control unit, so the same two AA batteries used to run the remote control are also used to charge the car. Despite their tiny size, I have a feeling these Nitro Speeders might actually outlast most of our other remote control cars. That's because of the ingenious design of the remote control unit: it's also the little car's charger and storage/carrying case. That makes it so much easier to keep everything together, and less chance something will get lost. I also love that the remote control unit doesn't have a retractable metal antenna -- those things always end up snapping off! The Nitro Speeders are certainly fast -- almost too fast, in my opinion. Once they get going, it's difficult to get them to stop or change directions, so our Nitro Speeder all too often ends up underneath beds, bookshelves, cabinets, refrigerators and stoves. You can't really control the speed, so you can't really slow the cars down. Hot Wheels Nitro Speeders are great fun to play with! One lucky Bonggamom Finds reader will win a Hot Wheels Nitro Speeders car. Leave a comment on this post tell me how your child would play with the Hot Wheels Nitro Speeders. This entry must be completed before any extra entries will count. 2) Follow Bonggamom Finds via GFC (1 entry). 3) Blog about this giveaway, making sure you include a link to the giveaway in your blog post (1 entry). This giveaway ends at 11:59PM PST on September 10, 2011; I will draw a winner at random on September 11 and post his/her name after she/he confirms acceptance. Continental US residents only. For additional giveaway rules, click here. Good luck! Disclosure: I received a product sample to facilitate my review, but have not been paid to review the product or give my opinions. Product information is provided by MomSelect and is indicated in italics. The views and opinions expressed here are my own. Instead of buying the same old plain folders, notebooks, pencil pouches, stickers and lunch bags, let your children’s imaginations run wild by giving them a fun way to decorate their school gear this year. You’ll save money on school supplies while at the same time buying products that your children are sure to love... Back-to-school shopping has never been so much fun! Each Make It Mine! package includes a customizable school supply item along with an 8 pack of RoseArt® Washable SuperTip markers. RoseArt sent us a Make It Mine spiral notebook, which I gave to 3Po to decorate. The cover design was of a robot surfing on a shark, which was cool and boyish and lots of fun. The black area is made of that velvet-y flocked material that kids love to touch, and the other areas were left blank to color. Being an identical twin, 3Po is always on the lookout for ways to make his stuff individual and unique, and you can't get any more individual than this. He enjoyed making this notebook his own, and so will your kids. Make It Mine school supplies by RoseArt are sold exclusively at Target, so don't forget to pick a couple up for your child on your next Target run. Disclosure: I received a product sample to facilitate my review, but have not been paid to review the product or give my opinions. Product information is provided by RoseArt and is indicated in italics. The views and opinions expressed here are my own. School starts next week, and despite their complaints about the lazy summer days being over, I know they're excited to get back to school and see their friends. I know that isn't always the case for every child, particularly teens going back to face another year of high school being pressured, bullied and taunted for the way they look, dress or act. That's one of the reasons I love the hit TV series GLEE. They aren't afraid to tackle sensitive issues that high school kids face: sexuality, alcohol, bullying and more. Of course, the great music and hilarious characters help! It's precisely the way GLEE incorporates the campy and funny with the serious is what makes this series so great. One of the biggest issues Glee has covered this season is bullying. All members of Glee are continually subject to bullying as they are considered to be the school losers and are frequently drenched by slushies. The New Directions have a strong attitude against the bullies and stick up for each other. Kurt in particular, played by Chris Colfer, experiences the brunt of bullying at McKinley High to the extent that he decides to move schools to Dalton Academy where a strict anti-bullying policy is enforced. It is testament to Glee and their effective treatment of this issue that Chris Colfer has gained leading status and reputable accolades including a Golden Globe award, demonstrating the worldwide appraisal of the series. Celebrities such as Miley Cyrus have admitted that they have been subject to bullying and Demi Lovato has openly spoken about being bullied. Demi has also created a Teens Against Bullying video to increase awareness and to help combat the problem. sexuality that they should be proud of who they are. 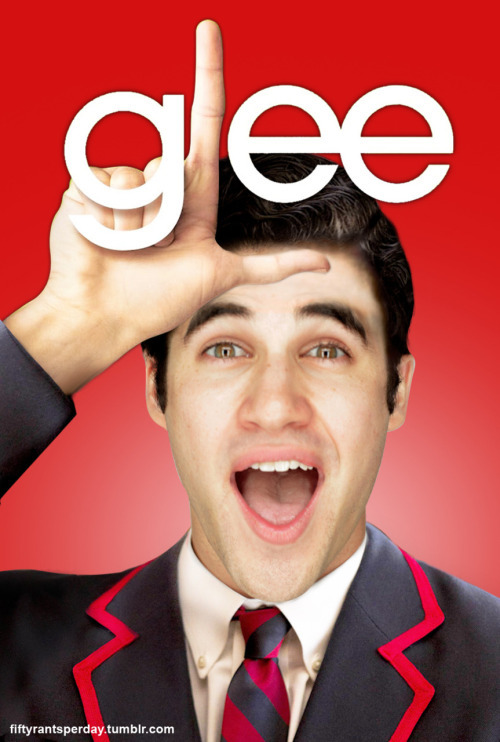 Blaine, Kurt's love interest who fronts Dalton Academy's Warblers, provides Kurt with help and reassurance and reinforces thefact that Kurt should be who he wants to be if it makes him happy. Santana and Dave Karofsky both experience mixed feelings about their sexuality and are not ready, like Kurt, to be open about this issue. Glee demonstrates the confusion that sexuality can create for individuals but helps to show the teenage audience that when the time comes, people will be there to help you through. We've all been there, having one too many to drink the night before work or school the next day and walking around with your friends wearing matching sunglasses. OK, maybe the last part is just Glee. Whilst Glee portrays this issue in a humorous and light hearted manner, the message is still very prominent about the serious effects of alcohol. Finn provides an enlightening discussion about the different effects of alcohol: Santana is the weepy drunk,Mercedes and Tina are the hysterical drunks who find everything funny and then Rachel and Blaine share a drunken kiss. Yet Finn doesn't touch a drop of alcohol, showing that teenagers do not have to bow to peer pressure and can abstain from drink if they choose to. During the release of Harry Potter and the Deathly Hallows Part Two, Daniel Radcliffe has also spoken about the damage of excessive alcohol consumption and the destructive nature it can have. Radcliffe states at one point he was dependent on alcohol but since giving it up has become a lot happier. Glee helps to shed light on these issues and have created fantastic role models for teenagers to look up to. Cleaning every grape individually, organising pamphlets on the desk and turning rigid at the thought of anything being messy. These are just some of the examples Emma Pilsbury's OCD, a condition that is often not acknowledged within TV series. 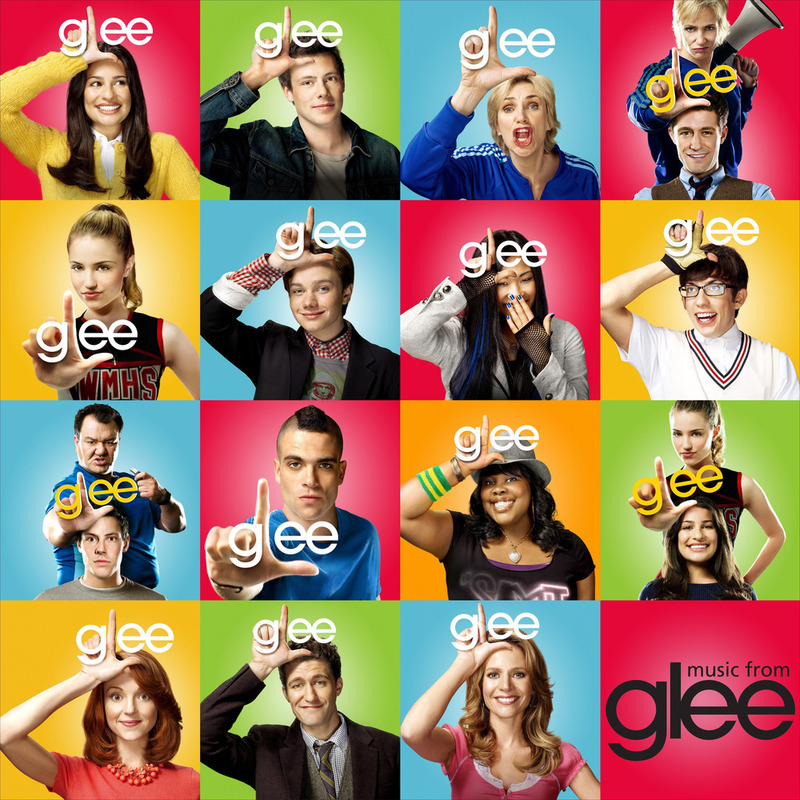 Glee illustrates the different characteristics of OCD and shows the help that isavailable for those who are living with it, as Emma herself decides to finally accept medical advice to control thedisorder in Series Two. However, it is refreshing to witness Emma's approach to her OCD, accepting that it is part of her and part of her personality with the overall message hopefully helping those who are dealing with OCD on theirown. Several celebrities also suffer or have suffered with OCD, including Jessica Alba, Leonardo Di Caprio and Cameron Diaz but all have made their peace with the condition to prevent it from ruling their lives. Growing up can be an extremely difficult time for adolescents and the pressure of physical appearance is growing to be an ever more increasing concern. 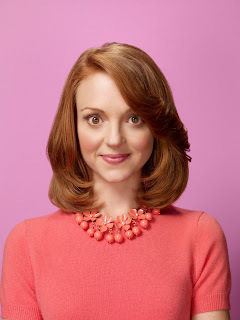 When Rachel is hit in the face by Finn and breaks her nose, the singer uses the opportunity to consider plastic surgery to change her features, despite the protests from her fellow members in New Direction. However, Rachel comes to the conclusion that she likes the way she looks and does not want torevert to plastic surgery. However, unlike Rachel, Quinn has had plastic surgery and has no regrets about herdecision. It is rare for a TV show to depict a story of someone whose life was changed for the better by surgery, but this further highlights the groundbreaking and genre-defying success of Glee. In fact, it is a more accurate depiction of real life, where plastic surgery can help benefit some but can also go horribly wrong. In a school like McKinley High, being popular is a massive issue and the school social ladder is a continual theme running throughout the whole of Series Two; several characters including Santana and Quinn are desperate to be at the top and be the most popular girl in school. Yet Glee and the members of New Directions show that as long as you have a caring group of friends that will always stick by you and you are happy with yourself if doesn't matter what your school status is. Being popular isn't everything! And the Born This Way episode epitomises this as theGlee members all wear t-shirts with their insecurities written on them. For instance, Finn's says Can't Dance andMike's says Can't Sing. Parents should remember that Glee shows teenagers that they should embrace these andbe proud of who they are! THE #1 TV ON DVD & BLU-RAY IS BACK! Which GLEE: THE COMPLETE SECOND SEASON episode highlights that kids should not be afraid to face their flaws? This entry must be completed before any extra entries will count. This giveaway ends at 11:59PM PST on September 6, 2011; I will draw a winner at random on September 7 and post his/her name after she/he confirms acceptance. Continental US residents only. For additional giveaway rules, click here. Good luck! Disclosure: I did not receive a sample or monetary compensation for this post . DVD information and school issues content were provided by ThinkJam and is indicated in italics. The views and opinions expressed here are my own. Our school year starts next week, and as much as I'm looking forward to seeing our school friends again and getting the kids occupied and engaged in class, I'm not looking forward to all the new infections and illnesses they're going to bring home with them. With 22 kids in each class, it's inevitable that germs and going to be passed around, so I try to teach my kids to take simple preventative measures, like coughing or sneezing into their elbows instead of their hands, avoid sharing lip balms or hairbrushes, wash their hands, and use antibacterial gel or antibacterial hand wipes. 1) I keep a canister of Wet Ones® Hand Wipes in the car. We're always on the go, so many times I have to give my kids a snack on the way to their soccer practice or dance lessons. I always forget to ask them to pass by the school washrooms to clean their hands after school lets out, so they can wipe their grubby hands in the car. 2) I keep a travel pack of Wet Ones® Hand Wipes in my purse, so we can wipe our hands at the park or in a movie theatre or anywhere we can't get to a restroom. 3) When I pack my kids' lunch, I always include a single pack of Wet Ones® Hand Wipes so they can wipe their hands and mouth after they eat their lunch. Wet Ones is kicking off a (hopefully) germ-free school year with some useful tips from noted pediatrician Dr. Sears, and some great promos. Check out the sweepstakes on their home page -- and enter a special giveaway right here! The Wet Ones® Give Your School a Hand Sweepstakes will give new books and healthy hands all year to five lucky Grand Prize winners -- and their schools. * Five winners will each receive a $75 Scholastic Gift Card, plus a $25 Variety Bundle of Wet Ones® Antibacterial Hand Wipes. * Each of the five winners' schools will receive a $250 Scholastic Book Library specially selected for schools, plus a $100 Variety Bundle of Wet Ones® Antibacterial Hand Wipes. You can enter up to once per day until September 29, 2011. Leave a comment on this post and tell me what you use Wet Ones® Hand Wipes for. This entry must be completed before any extra entries will count. 1) Leave a comment on this page and tell me how you would spend your $100 on Ice (1 entry). This giveaway ends at 11:59PM PST on September 5, 2011; I will draw a winner at random on September 6 and post his/her name after she/he confirms acceptance. Continental US residents only. For additional giveaway rules, click here. Good luck! Disclosure: Energizer Personal Care is providing me with product samples for review. Also, Energizer Personal Care is providing the prizes for this promotion at no cost to me. This promotion is not being administered or sponsored in any way by Energizer Personal Care or its affiliates, but solely by Bongga Mom. Any questions or comments regarding this promotion must be sent to me at Bongga Mom and not to Energizer Personal Care. The views and opinions expressed here are my own. Attention, bling lovers: online jewelry retailer Ice.com has given their site a makeover, and they are launching their new look today. Ice.com has been selling all kinds of beautiful jewelry online since 1999: rings, earrings, bracelets, necklaces and more, featuring diamonds, rubies, gold, silver and all the materials you love, at prices ranging from under $100 to $1000. They offer 100% satisfaction guaranteed. Everyone needs a makeover from time to time. … and it’s time. With our new look comes new styles, launching all the time. We will be bringing customers the latest jewelry trends from around the world, as well as keeping you covered with the classics. We attached a screenshot of the new site to give you a sneak peak! We’re always discovering new and unique approaches to fine jewelry, and will be bringing a wide range of new and dazzling collections of jewelry to our customers. Some of our latest include, The Eclipse Collection, Gallery 10, The Diamore Rainbow Collection and Mom & Me Collection. Stay tuned for more gorgeous assortments in the weeks and months to come. Jewelry is fashion… and fashion is design! We’re creating partnerships with some of the leading fine jewelry designers from around the world to bring you some stunning looks like Michiko’s dazzling approach to pearls, and the modern and innovative bracelet designs from Tattooed Steel. We’ll be launching many more designers in the days ahead, so keep an eye out. We get our inspiration from the most amazing people…. And we’re partnering with thought leaders from throughout the web and the world of fashion and jewelry. We’ve hooked up with some outstanding women - celebrity stylists, editors from leading fashion magazines, award-winning artists and business leaders – to get their take on jewelry and fashion, and to commission unique collections of jewelry from the Ice catalog. We’re always looking for new approaches, so if you’re interested in being a Guest Stylist for Ice, let me know. Our customers asked and we listened. We’re thrilled to offer all of our US customers FREE Shipping and FREE Returns on all orders. Saving on shipping means more to spend on fabulous jewelry! Free Returns means you can shop with absolute confidence. Check out their Twitter and Facebook pages for more news and updates! To celebrate Ice.com's newly redesigned site, one lucky Bonggamom Finds reader will win $100 to spend on Ice.com (some exclusions apply, see rules below)! Ice has a collection of jewelry inspired by what movie? $100 prize is not applicable on sale or clearance items, watches, engagement rings or The Persona Charms Collection. Not applicable on taxes or shipping costs, and cannot be combined with any other offer. This giveaway ends at 11:59PM PST on August 26, 2011; I will draw a winner at random on August 27 and post his/her name after she/he confirms acceptance. Continental US residents only. For additional giveaway rules, click here. Good luck! Disclosure: I did not receive a sample or monetary compensation for this post. Site information is provided by Ice.com and is indicated in italics. The views and opinions expressed here are my own.